Child protection is a serious issue in today’s society. There are laws, policies and procedures to ensure the welfare of children and young people. Schools are required to provide a protective and caring environment where student safety and well-being are paramount. In Australia, working with children checks are required by law before people can work or volunteer in settings with children and young people. School education systems have clear guidelines for teachers on what constitutes acceptable practice and respectful behaviour towards students. When you first use VR headsets and hand controllers they can be awkward to put on, take off and adjust. Students often ask teachers, researchers or other students to help them with this. Even with a virtual guardian or chaperone system which indicates safe boundaries, people can move around in VR and come too close to objects putting them at potential risk. It is sometimes necessarily to help students to re-orientate back to a safe space in the real world so that they can avoid hitting objects (as part of the VR School project we always have a ‘spotter’ who looks out for the safety of students). When using a headset a person is either in darkness while they are waiting for an application to load or in the virtual world; basically, they cannot see what is going on outside or who is near them. It can be a bit of a shock to be in a virtual world and have someone in the real world start talking to you or putting a hand on your shoulder! Importantly, we need to be particularly mindful of students who have special needs, life circumstances or cultural norms which have made them touch-adverse. So how can teachers, researchers and student-helpers interact with a person in VR in a safe and respectful way? Globally, an estimated 1.4 billion people play computer games, with growth in popularity driven by mobile device uptake, app proliferation and social media engagement. In Australia, around 98% of households with children have video games, 90% of gamer parents play games with their children, and 35% of children have played games as part of the school curriculum. There are two types of games used for learning. The first type are ‘serious games’. These are designed to harness the popularity of recreational gaming for specific educative or training purposes. The second type are commercial off-the-shelf (COTS) games. These are recreational games that can be adopted/adapted for learning (the original versions of Minecraft are an example of this). There is growing evidence that serious and COTS games can be highly motivating and produce positive effects on learning. However, teachers do face decisions about the selection of games, their alignment to curriculum, suitability for learners, and their place in the pedagogical repertoire. In this networked world, there are also ethical and technical issues to resolve. To assist teachers in choosing and using computer games effectively in classrooms, we have produced a paper on evidence related to this and we have developed a practical framework in poster form (above). 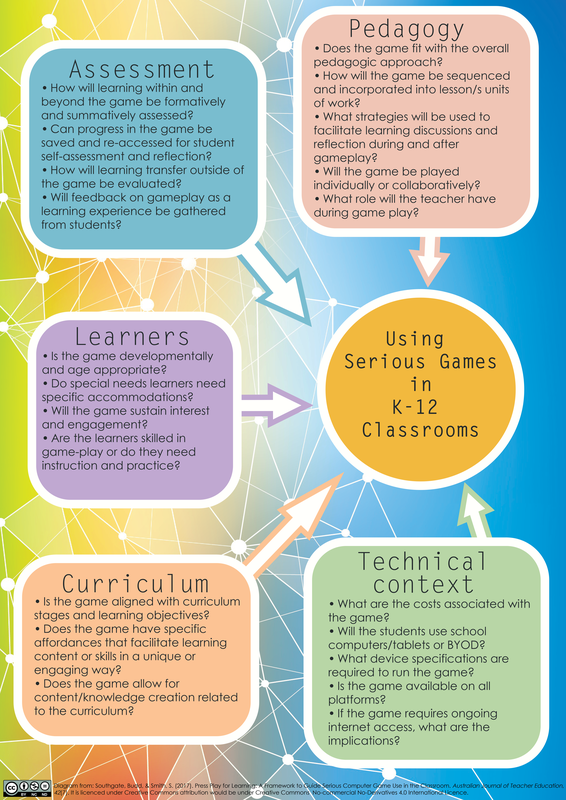 This framework is designed to scaffold teachers to ask critical questions about gaming for learning. We hope that it can be used to increase the effective integration of games into classrooms to benefit both teachers and learners. Dr Shamus Smith and Associate Professor Erica Southgate, developers of the serious games for literacy, Apostrophe Power and Sentence Hero (link to game apps here), available for free download from the App Store and Google Play. References are in the paper (link above).